The fast-growing, extremely hardy Washingtonia Palm can provide big tropical landscape appeal in a hurry. They're a favorite with builders who want to give a finished look to a newly constructed home, and with homeowners who want more instant gratification. And for people who want only the most cold-tolerant of plants, the washingtonia is your palm. These are the some of the most cold hardy of all South Florida palms...growing even north of Florida in Zone 8. Unfortunately, Mexican fan palms, as they're also called - though big, fat and gorgeous while young - tend to lose their good looks (don't we all) with age. The thick trunk of the youthful palm thins, and a "petticoat" of dried fronds under the green ones on top is not everyone's idea of palm beauty. Washingtonias grow fast - yet the rate can vary from palm to palm. No two grow at the same pace, so pairs of these palms are not a good choice for symmetrical landscape design. They can grow to 100 feet tall - but many don't make it, since lightning often strikes anything towering over the rest of the landscape. Very cold hardy, "washies" will grow anywhere in Florida (and north even into southern Texas through southern parts of South Carolina). 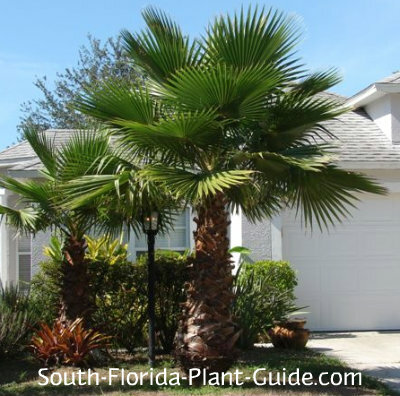 These palms are moderately salt-tolerant and moderately drought-tolerant once established. They do best with regular waterings, allowed to dry out in between. Left in a natural state, browned fronds of a washingtonia palm will form a very long "hula skirt" of thatch. Most people, however, prefer a cleaner look and trim off old fronds fairly often. Once the palm is too tall to reach, leave the old fronds on or hire someone to trim. "Boots" (old leaf bases) are a bright and attractive red-brown while the palm is young. As they age, you can remove them by hand or leave them on (they'll fall off on their own eventually) to form a spiky decoration above the smooth trunk. Washingtonias are happier in a less humid climate than ours, so pick a sunny, well-drained place where the palm will get good breezes. Soil amendments aren't really necessary. Watering on a regular basis with time to dry out between waterings will keep the palm looking its best. 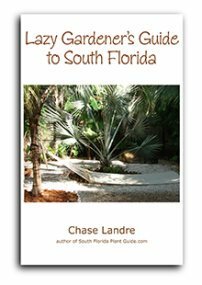 Fertilize in spring, summer and fall with a good palm fertilizer containing micronutrients. Beware of the sharp teeth on the palm's leaf stems. Plant at least 6 to 8 feet away from the house to give the big fronds room to spread out. If planting in a row, place them at least 6 feet apart. For using along a drive, come out at least 5 or 6 feet so the young palm's wide crown isn't in the way. This palm is too fast and too big to make a good container plant. COMPANION PLANT SUGGESTIONS: Copper plant, gold mound, arboricola, clusia guttifera, selloum philodendron, Panama rose, and jatropha.